Well here is the review of the Rosemary & Co brushes I’m using. So far I have to say I am very impressed with everything that the brushes have to offer over all. 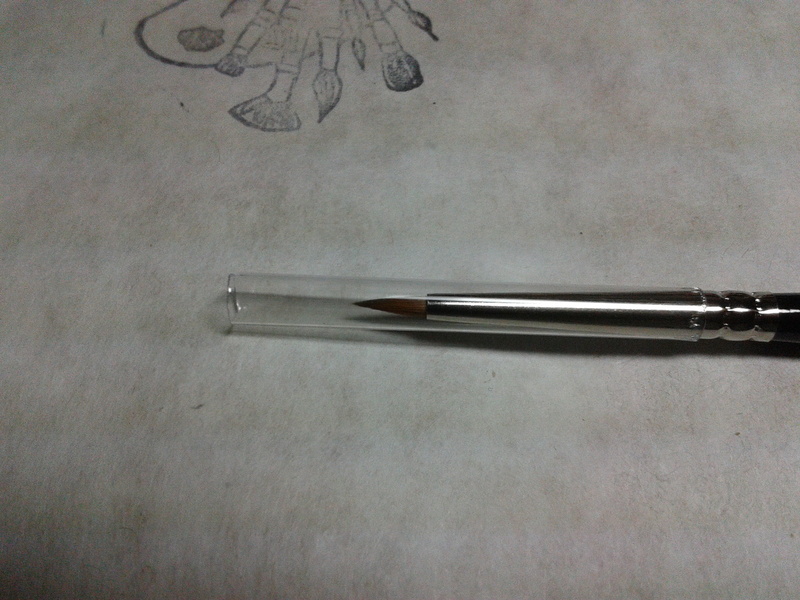 I’m going to be comparing them to my Windsor & Newton Series 7, each thing I look for in a brush is going to be marked upto a score of 5, with an over all score at the end. 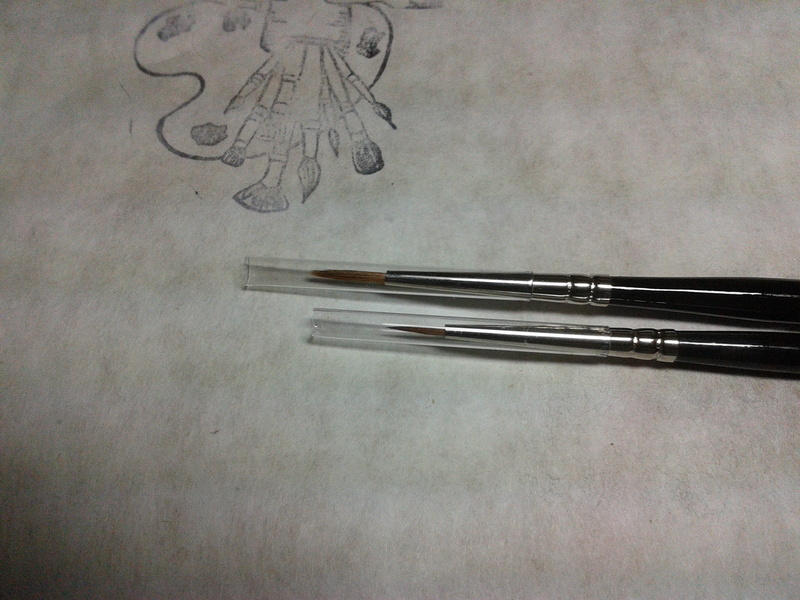 So as you can see, the Rosemary & Co brushes literally stripped the Windsor & Newton Crown. So in this bit I will define what each category means. Shape = Over all shape of the brush, I find the Rosemary & Co brush has a lot more shape to it and doesn’t look as flat as the W+N one does. Comfort = If you are going to be holding a brush for a long time, then obviously it needs to be comfortable in the hand, it makes for ease of use and a lot more control. 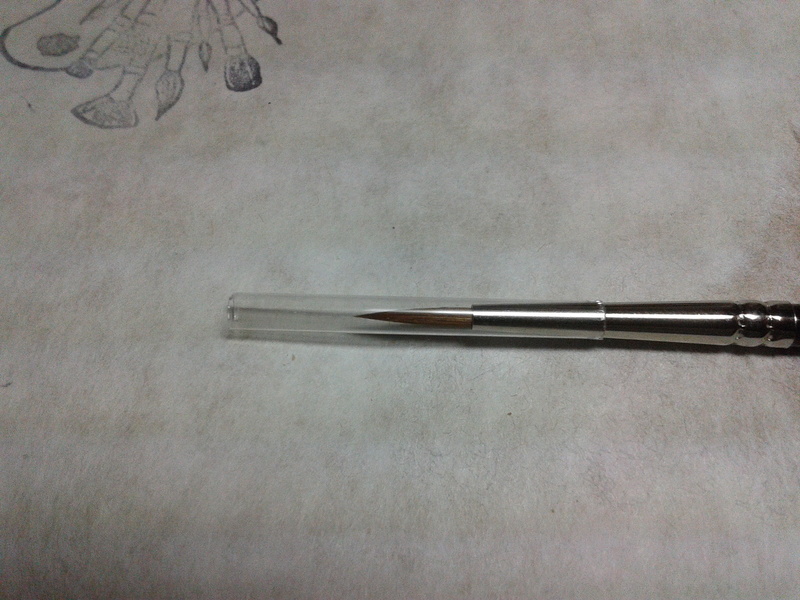 Bristles = Even if you are only putting a small amount of paint on the tip, you can still find that some brushes (cheaper makes especially) have a tendency of spreading out. Longevity = How long the brush lasts under heavy abuse, and admit it, we are all prone to that one. Point = how easy the point loses its shape, whether thats through spreading, or through it curling. 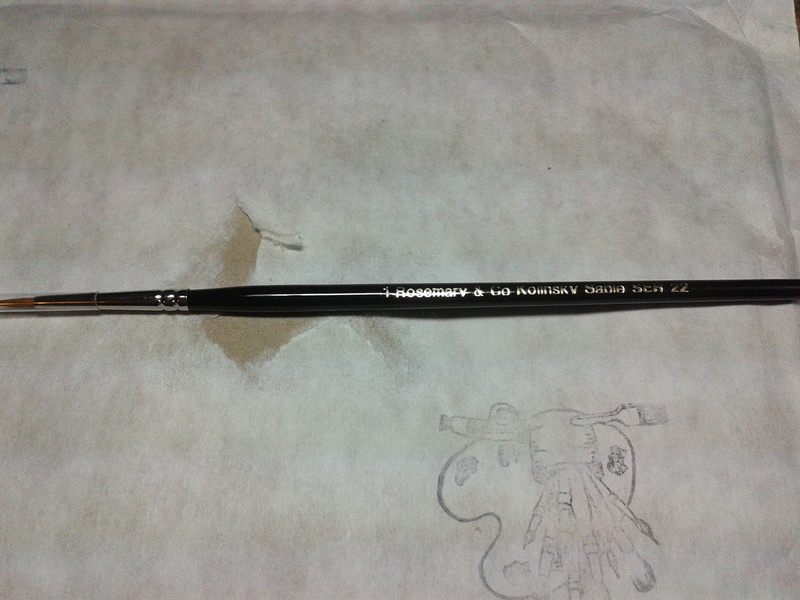 I find that the Rosemary & Co brushes certainly out perform the W+N Series 7 on that one, I left both brushes at funny angles and the Windsor + Newton started to droop after about 5 minutes, where as the R&Co kept its shape. Price = Do I even need to go into this one? On a brush to brush basis R&Co cost atleast half of what W+N do, and for a brush that is marginally better I’d rather pay for the cheaper option. You also have to take into account that our hobby isn’t cheap as is, so spending lots of money on brushes sometimes just isn’t an option. Well here it is finally, after a long three week delay, due to the British Post Office who kept losing them. I got the brushes from Rosemary & Co. So in the package, apart from their newsletter and a catalogue, was 4 Kolinsky Sable brushes for me to try out. 2 x Series 33 – Size 0 and 3/0. For those that don’t know what a 3/0 is, its what we used to call a “Triple Zero” back in the day. I have to say, just by holding the brushes they feel a lot different to the two Windsor + Newton Series 7’s I own, and by different I mean nicer to hold. Also the “Snap & Spring” of the brush is a lot finer than my Series 7’s, which holds a lot of promise when it comes down to using them, that will hopefully make them a very nice “workhorse” brush. Now for the difference of the brushes within the series. 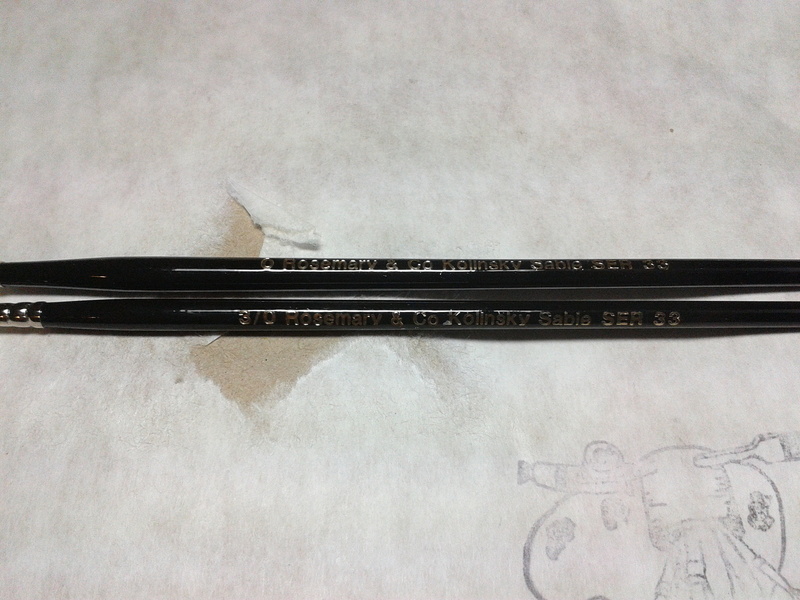 The Series 33 aren’t at first glance really any different from the Series 22 brush, apart from the fact that it is more pointed. Which suggests, at least to me, that its designed to do the whole package… namely washes, layers and basecoats. 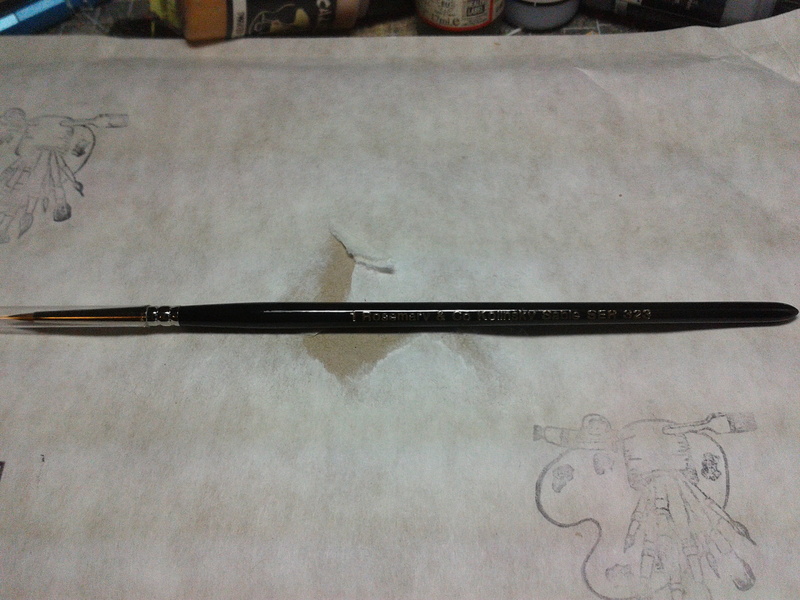 The Series 22 seem to be more designed for doing freehand, and is a lot thinner and defined than the Series 33 brushes. Now the Series 323 looks like it could be for doing things like eyes on 28mm miniatures, or is a spotter brush. So over all, these look like they certainly wont fan like the tips of my Series 7 do. This makes me very positive in the long run about how these brushes are going to hold up compared to brushes that are a lot more heavily priced. Price wise they are a lot cheaper than Windsor + Newton, by at least £3, and about £1 dearer than Broken Toad Kolinsky’s, but if they hold up as well as I expect them too then I’d say they would be perfectly priced. So here’s hoping to me being able to stock them in my shop/cafe venture as I expect them to sell really well.